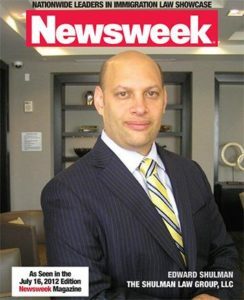 Immigration Attorney Edward Shulman’s expert legal opinion was most recently sought by the online celebrity and entertainment news site Hollywood Life, a subsidiary of Penske Media Corporation launched by longtime magazine editor Bonnie Fuller, the former editor of the magazines Cosmopolitan, Glamour, and Us Weekly. Attorney Shulman provided an exclusive interview, as part of the “Expert Says” series in which Los Angeles-based Hollywood news reporter Sarah Jones asked him to provide an expert opinion on the Joe Giudice case for Hollywood Life’s March 15th celebrity news edition. At issue is what will happen to Giudice who was released from a low security correctional facility in Allenwood, Pennsylvania on March 14th after having served nearly three years for bankruptcy fraud and conspiracy to commit mail and wire fraud. At present, Giudice is detained in the custody of the United States Immigration and Customs Enforcement (ICE) while waiting for a decision on his appeal in response to a deportation order. The overarching question is whether, if ordered removed from the United States since Giudice is not a U.S. Citizen, he could immigrate to Canada instead of to Italy, his native country. The rationale for exploring the option of immigrating to Canada has to do with his desire, as the father of four children, to be closer to his family. In the interview, Shulman explains the concept of an Aggravated Felony in immigration terms, why the Immigration Judge initially disallowed him the opportunity to have his case heard which led to an appeal before the Board of Immigration Appeals (BIA), the appeal process, and Giudice’s options, including under what circumstances it would be possible for him to eligibly immigrate to Canada instead of Italy.